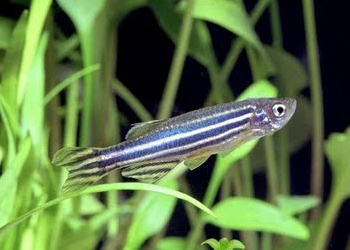 In 1986, Kasymyan & Ponomarev have published the results of their behavioural experiments with several tens of zebrafish, Brachydanio rerio, divided into two training groups. In training Group 1, fish were fed (from birth to 3 month age) planktonic Cladocera and bloodworms (Chironomus plumosus), in Group 2  Cladocera and sludge worms (Tubifex tubifex). Then fish were moved into an experimental aquarium, where they had the possibility to select one of two sections: with water extract of bloodworms and, respectively, with water extract of sludge worms (under concentration of these extracts 10-2 – 10-3 g/l). According to Kasumyan & Ponomarev (1986), fish of the first group preferred (displaying search feeding behaviour) an aquarium section with the Chironomus plumosus odor, and vise versa — fish of the second group preferred another section, with the Tubifex tubifex odor. In other words, training fish preferred the familiar feeding odors. In general and applied ethology, this phenomenon is considered in the terms of an acquired search image. An acquired search image forms in the long-term memory of an animal during its learning (both in the nature or laboratory) and is used further as an etalon (template, specimen) to collate the receiving perceptual information. In our case, an acquired chemical search image forms in respect of an odor of some object. How chemical search images form in other fish and crustaceans, study the basic references given below. In 1997, Ivlev has published the results of his laboratory feeding experiments with several tens of common carp, Cyprinus carpio, divided into four training groups. In training Group 1, fish were fed only chironomidae larvae (bloodworms), in Group 2  sideswimmers, in Group 3  water louses, and in Group 4  freshwater molluscs, respectively. After 10 days of training, fish of each group were moved on mixed, four-component diet contained the foregoing food items in equal parts. Interestingly, in this mixed diet fish selected predominantly familiar foods, remembered by them in the 10-day training period (see Table). In trophic ecology, this phenomenon is named an acquired food electivity (acquired feeding electivity). Generally, an index of food electivity, denoted by letter E, can range from -1 (absolute rejection) to +1 (absolute preference). E=0 means that some food is not rejected and is not preferred (that is this food is indifferent on electivity for an eater). In general and applied ethology, the same phenomenon is considered in the terms of search image. An acquired serch image forms in the long-term memory of an animal during its learning (both in the nature or laboratory) and is used further as an etalon (template, specimen) to collate the receiving perceptual information. Without constant verification, an acquired serch image is forgotten within some time period. In our context, search images can form in respect of food or live prey, their colors, odors and other stimuli.